Major salivary glands are easily accessible; therefore, they are optimal targets for fine-needle aspiration (FNA). This technique has been used for decades in Europe, but it is still controversial in the United States. The large numbers of benign and malignant tumors that can originate in the glands, as well as the lack of cytological markers to accurately diagnose the various tumors, often foster uncertainty in fine-needle aspiration (FNA) diagnosis of salivary gland masses. Therefore, the primary challenge of fine-needle aspiration (FNA) is differentiating benign from malignant disease and then differentiating the various malignancies. Although several papers indicate that the sensitivity and specificity of fine-needle aspiration (FNA) and frozen section of salivary glands are similar, malignant salivary gland lesions have always been difficult to classify with fine-needle aspiration (FNA) alone. Frozen section diagnosis should be more effective than fine-needle aspiration (FNA) in diagnosing salivary gland tumors; unfortunately, it has a less-than-perfect track record. In a 1987 report, Conley notes that pathologists change their frozen section diagnosis in 10% of cases. In a study of 256 salivary tumors, errors in judging malignant versus benign tumors with frozen section diagnosis occurred in 5% of cases. In 4 cases (1.6%), a malignant frozen section diagnosis was changed to benign with permanent sections. This is the most important error because it could result in more radical resection than necessary. The authors reiterated the well-known notion that radical surgery is imprudent based on the frozen section findings alone. In a similar study of 75 patients (14 malignant), no benign lesions were overdiagnosed as malignant by frozen section examination. In 4 cases, a benign diagnosis on frozen section analysis was revised to malignant with permanent section examination. Although overall diagnostic accuracy was only 85%, no patient underwent unnecessary surgery, and 4 patients benefited from more radical surgery based on the frozen section diagnosis. This study shows that exceptions can be made to the rule that radical salivary gland surgery should never be performed on the basis of frozen pathology alone. A study of 220 cases of parotid gland fine-needle aspiration (FNA) with histological follow-up was conducted to compare relative accuracies of both fine-needle aspiration (FNA) and frozen section. Frozen section was performed in 57 of these cases. Sensitivity, specificity, and accuracy for fine-needle aspiration (FNA) when diagnostic were 86%, 92%, and 90%, respectively. Frozen section was able to change 4 malignant diagnoses by fine-needle aspiration (FNA) to benign and provide diagnosis for 5 of the 12 nondiagnostic fine-needle aspirations (FNAs). The sensitivity, specificity, and accuracy of frozen section were 77%, 100%, and 88%. Differentiation of inflammatory from neoplastic disease: This is especially important in patients who are immunosuppressed. Squamous cell carcinoma evaluation: Squamous cell carcinoma can be accurately diagnosed, and treatment can be planned based on fine-needle aspiration (FNA) findings. A highly cellular mucoepidermoid carcinoma may appear to be squamous cell carcinoma by fine-needle aspiration (FNA) cytology. This difference is purely academic and does not change the treatment. Malignancy determination: The pathologist is usually able to very accurately render an opinion about the malignant or benign nature of the lesion. This is a great help in promptly guiding treatment, and this is further addressed below. The use of fine-needle aspiration (FNA) allows for immediate assessment of the lesion in an outpatient setting. In the author's institution, most fine-needle aspirations (FNAs) of the salivary glands are performed in an outpatient setting. Immediate assessment of the material is usually possible within 15 minutes. This initial assessment is helpful in relieving the anxiety of the patient and aids in clinical decision-making. The use of fine-needle aspiration (FNA) in working up salivary gland tumors is also cost effective. Two recent studies have shown that the use of fine-needle aspiration (FNA) in salivary gland tumors is cost-effective and diagnostic. [6, 7] Specifically, Layfield et al demonstrated that the routine use of fine-needle aspiration (FNA) in the work-up of salivary gland lesions saves up to $70,000 per 100 patients. At the same time, fine-needle aspiration reduces the operative intervention by 65% in submandibular masses and by 35% in parotid masses. The skin is cleaned with an alcohol swab. A 25- or 23-gauge needle is used on a plastic disposable 10- or 20-mL syringe attached to a plastic or metal holder. The nodule is immobilized between the fingers, and the needle tip is rapidly directed through the skin into the nodule. Once the needle enters the mass, the needle is continuously aspirated while the needle is rapidly moved in and out to obtain the sample. Suction is then relieved, and the needle is withdrawn and detached from the syringe. Air is aspirated, and the material is expelled on glass slides (see the images below). The material is gently but rapidly smeared on the slides and immediately dipped in alcohol fixative. Some of the slides can be left to air dry for Diff-Quick staining and rapid evaluation. The fixed material is stained by Papanicolaou or hematoxylin-eosin stains, which are both excellent for nuclear detail. 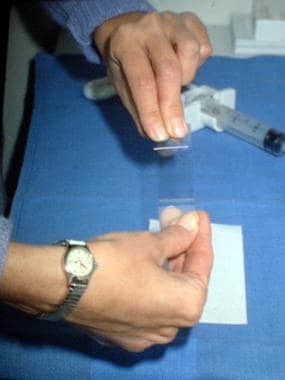 Photograph showing an aspirate being placed on a glass slide. 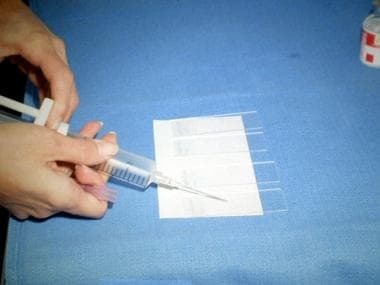 After the 20-mL disposable syringe with an attached 21-gauge needle is placed under the skin surface and the mass is aspirated, a small drop of aspirated fluid is placed on a glass slide. Photograph showing the smear technique for plating a sample aspirate. After a small drop of fluid is placed on a glass slide, a second slide is used to smear the aspirate evenly over the surface of the slide. The slide is then prepared for cytologic evaluation. Needle track contamination by malignant cells: Numerous studies indicate that needle tract contamination by malignant cells is a rare complication despite thousands of fine-needle aspirations (FNAs) performed worldwide. A positive correlation exists with number of passes and needle size. Local hemorrhage: Because major salivary glands are in close proximity to the great vessels of the head and neck, local hemorrhage due to piercing of these vessels is possible but very unlikely. Physicians can prevent hematoma formation by applying firm pressure in the area of aspiration immediately after the procedure. Infection: This risk is no greater than that of venipuncture and is closely correlated with the patient's immune status. Adherence to sterile techniques and cleaning the skin with alcohol minimizes this risk. Syncope: Some patients are prone to vasovagal reactions. Physicians should be prepared for this complication. Perform aspiration while the patient is lying down or sitting. Bleeding diathesis: Because control of local hemorrhage depends on hemostasis and clotting, bleeding diathesis is a contraindication. Uncooperative patient: Most nondiagnostic fine-needle aspiration (FNA) findings result from noncooperation by the patient. Prior to fine-needle aspiration (FNA), the physician should calm the apprehensive patient. Before making a definitive treatment decision, combining fine-needle aspiration (FNA) results with other data is prudent clinical practice. A typical example is a cytologic diagnosis of a lymphoepithelial cyst. The cyst is common in patients who have immunodeficiency virus (HIV); these patients tend to have bilateral lymphoepithelial cysts, and their findings are typical on CT scanning. Typically, these patients can be managed by serial examinations and occasional serial therapeutic aspiration. Lymphomas may also be accurately diagnosed if adequate tissue can be obtained for flow cytometry. A patient with a fine-needle aspiration (FNA) diagnosis of Warthin tumor may be best served by having a technetium scan confirmation without surgery if significant medical contraindications to surgery exist. Recurrent tumors may also be accurately diagnosed using fine-needle aspiration (FNA). Some situations exist where a benign fine-needle aspiration (FNA) cytologic appearance should be viewed with suspicion. If the mass is painful, appears to be invading surrounding structures, or co-exists with an ipsilateral facial nerve palsy and the fine-needle aspiration (FNA) is benign, then the mass may be malignant despite a benign cytologic appearance. Although fine-needle aspiration (FNA) is very accurate, situations exist where the final permanent pathology differs from the fine-needle aspiration (FNA) result. The following statistics demonstrate the high level of sensitivity and specificity of FNA in salivary gland lesions. Because of the referral pattern at these institutions, the distribution of the salivary gland lesions summarized here does not necessarily reflect the true incidence in the general population. Sampling error: Correct identification and immobilization of the lesion should allow the pathologist to avoid undersampling the lesion. Having the pathologist who performs the fine-needle aspiration (FNA) also interpret the lesions is a tremendous advantage. Interpretation error: Pathologist experience minimizes this error. Lack of flow cytometry use: Many of the false-positive and false-negative interpretations of lymphoma could have been prevented with flow cytometry. Lack of immunophenotyping studies: These studies can improve interpretation of low-grade lymphoproliferative processes. Some tumors have unique characteristics that can be discovered using special techniques. Although these are helpful, they are not always completely diagnostic. Mucin stains (eg, mucicarmine, periodic acid-Schiff [PAS]) can identify mucin in mucoepidermoid carcinomas. PAS can identify the glycogen in acinic cell carcinomas. S100: Some spindle cell myoepitheliomas may be very difficult to diagnose without help of positive S100 immunostains. Cytokeratin: Cytokeratin confirms the epithelial nature (ie, versus melanoma, lymphoma, sarcoma) of a tumor. Vimentin: Vimentin confirms the immuno-viability of cells. Leukocyte common antigen (LCA): LCA confirms malignant lymphoma. Electron microscopy (EM): EM can identify mitochondria in myoepitheliomas. Flow cytometry: Flow cytometry is particularly useful in primary diagnosis and follow-up of hematolymphoid neoplasms. Fine-needle aspiration (FNA) of the salivary glands is a safe and reliable technique in the primary diagnosis and follow-up of patients. This technique is used with great success in Europe and is gaining increased popularity in the United States as the experience of pathologists and confidence of clinicians increase. With the application of special techniques, fine-needle aspiration (FNA) can be a very important part of clinical decision-making and preoperative counseling in most cases. As always, the patient's overall status must be assessed, and an individual treatment plan must be created in each case. Although patients with high cardiac risk may be best served by observation given a benign fine-needle aspiration (FNA) diagnosis, young healthy patients may require surgical intervention regardless of a negative fine-needle aspiration (FNA) finding. A negative fine-needle aspiration (FNA) finding alone should not prevent surgical intervention when it is otherwise clinically indicated. Similarly, fine-needle aspiration (FNA) alone cannot dictate the extent of surgery because that judgment is based on tumor location and patient status. Sacrifice of the facial nerve or other structures is generally best guided by findings at surgery rather than mindless obedience to preoperative dictums, as noted by Spiro: "Facial nerve preservation is ill advised when a parotid tumor has to be transected to spare the nerve. This rule applies even when the tumor is benign." This is not to say that decisions are always easy. On the contrary, making on-the-spot decisions with unusual tumor types that cannot be diagnosed with certainty at the time of surgery is often difficult. Ultimately, diagnosis and treatment depend upon the experience of the pathologist and surgeon when dealing with anything less than permanent section diagnosis. In a center that has a relatively large volume and a pathologist with a great deal of experience and interest in salivary gland tumors, fine-needle aspiration (FNA) and/or frozen section diagnosis may be adequate to make preoperative and operative decisions. Conley J. Controversies regarding therapy of tumors of the salivary gland. Thawley SE, Panje WR, eds. Comprehensive Management of Head and Neck Tumors. Philadelphia, Pa: WB Saunders; 1987. 1151. Siewert B, Kruskal JB, Kelly D, Sosna J, Kane RA. Utility and safety of ultrasound-guided fine-needle aspiration of salivary gland masses including a cytologist's review. J Ultrasound Med. 2004 Jun. 23(6):777-83. [Medline]. Seethala RR, LiVolsi VA, Baloch ZW. Relative accuracy of fine-needle aspiration and frozen section in the diagnosis of lesions of the parotid gland. Head Neck. 2005 Mar. 27(3):217-23. [Medline]. Pantanowitz L, Thompson LDR, Rossi ED. Diagnostic Approach to Fine Needle Aspirations of Cystic Lesions of the Salivary Gland. Head Neck Pathol. 2018 Mar 9. [Medline]. Stacchini A, Aliberti S, Pacchioni D, Demurtas A, Isolato G, Gazzera C, et al. Flow cytometry significantly improves the diagnostic value of fine needle aspiration cytology of lymphoproliferative lesions of salivary glands. Cytopathology. 2013 Jul 19. [Medline]. Layfield LJ, Gopez E, Hirschowitz S. Cost efficiency analysis for fine-needle aspiration in the workup of parotid and submandibular gland nodules. Diagn Cytopathol. 2006 Nov. 34(11):734-8. [Medline]. O'Donnell ME, Salem A, Badger SA, et al. Fine needle aspiration at a Regional Head and Neck Clinic: A clinically beneficial and cost-effective service. Cytopathology. 2008 Jan 30. [Medline]. Kim MW, Kim DW, Jung HS, Choo HJ, Park YM, Jung SJ, et al. Factors Influencing the Outcome of Ultrasound-Guided Fine-Needle Aspiration for Salivary Gland Lesion Diagnosis. J Ultrasound Med. 2016 May. 35 (5):877-83. [Medline]. [Full Text]. Suen KC. Atlas and Text of Aspiration Biopsy Cytology. Baltimore, Md: Williams & Wilkins; 1990. Bahar G, Dudkiewicz M, Feinmesser R. Acute parotitis as a complication of fine-needle aspiration in Warthin's tumor: A unique finding for a 3-year experence with parotid tumor aspiration. Head Neck Surg. 2006. 134:646-649. Mohammed Nur M, Murphy M. Adequacy and accuracy of salivary gland fine needle aspiration cytology. Ir J Med Sci. 2016 Aug. 185 (3):711-6. [Medline]. Hughes JH, Volk EE, Wilbur DC. Pitfalls in salivary gland fine-needle aspiration cytology: lessons from the College of American Pathologists Interlaboratory Comparison Program in Nongynecologic Cytology. Arch Pathol Lab Med. 2005 Jan. 129(1):26-31. [Medline]. Schmidt RL, Jedrzkiewicz JD, Allred RJ, Matsuoka S, Witt BL. Verification bias in diagnostic accuracy studies for fine and core needle biopsy of salivary gland lesions in otolaryngology journals: A systematic review. Head Neck. 2013 Sep 30. [Medline]. Batsakis JG. Tumors of the Head and Neck. 2nd ed. Baltimore, Md: Williams & Wilkins; 1982. 116. Cross DL, Gansler TS, Morris RC. Fine needle aspiration and frozen section of salivary gland lesions. South Med J. 1990 Mar. 83(3):283-6. [Medline]. Echavez MI, Lee KC, Sooy CD. Tetracycline sclerosis for treatment of benign lymphoepithelial cysts of the parotid gland in patients infected with human immunodeficiency virus. Laryngoscope. 1994 Dec. 104(12):1499-502. [Medline]. Friedman M, Rice DH, Spiro RH. Difficult decisions in parotid surgery. Otolaryngol Clin North Am. 1986 Nov. 19(4):637-45. [Medline]. Gates GA. Radiosialographic aspects of salivary gland disorders. Laryngoscope. 1972 Jan. 82(1):115-30. [Medline]. Hillel AD, Fee WE Jr. Evaluation of frozen section in parotid gland surgery. Arch Otolaryngol. 1983 Apr. 109(4):230-2. [Medline]. Jayaram N, Ashim D, Rajwanshi A, Radhika S, Banerjee CK. The value of fine-needle aspiration biopsy in the cytodiagnosis of salivary gland lesions. Diagn Cytopathol. 1989. 5(4):349-54. [Medline]. Jeong JY, Ahn D, Park JY. Fine-Needle Aspiration Cytology of Low-Grade Cribriform Cystadenocarcinoma with Many Psammoma Bodies of the Salivary Gland. Korean J Pathol. 2013 Oct. 47(5):481-485. [Medline]. Mondal A, Das MM, Mukherjee PK. Fine needle aspiration biopsy cytology in diagnosis of salivary gland tumours. J Indian Med Assoc. 1989 May. 87(5):108-10. [Medline]. Sismanis A, Merriam JM, Kline TS, Davis RK, Shapshay SM, Strong MS. Diagnosis of salivary gland tumors by fine needle aspiration biopsy. Head Neck Surg. 1981 Jul-Aug. 3(6):482-9. [Medline]. Wheelis RF, Yarington CT Jr. Tumors of the salivary glands. Comparison of frozen-section diagnosis with final pathologic diagnosis. Arch Otolaryngol. 1984 Feb. 110(2):76-7. [Medline]. The authors and editors of eMedicine gratefully acknowledge the contributions of previous authors Sung-Won Kim, MD, MS, and S Tunc Gokaslan, MD, to the development and writing of this article.